"Hi Jay, First let me thank you for an absolutely fabulous workshop at the Monson Free Library. Our families had such a great time and it was wonderful to see kids completely engrossed in building and experimenting and playing. Your balance of sharing information and then just getting out of their way was brilliant. Parents and kids both expressed how much they loved the program - thank you for a great afternoon." "Jay is phenomenal! Jay arrived early. My group consists of grades kindergarten through 4th. The children sat attentively during Jay's demonstration and asked and answered many pertinent questions. Jay provided a huge assortment of materials for the children. They had so much fun constructing, creating, taking things apart, and rebuilding. It was awesome to watch the children think and see their wheels turning as they worked on their machines. We can't wait to have Jay back!" 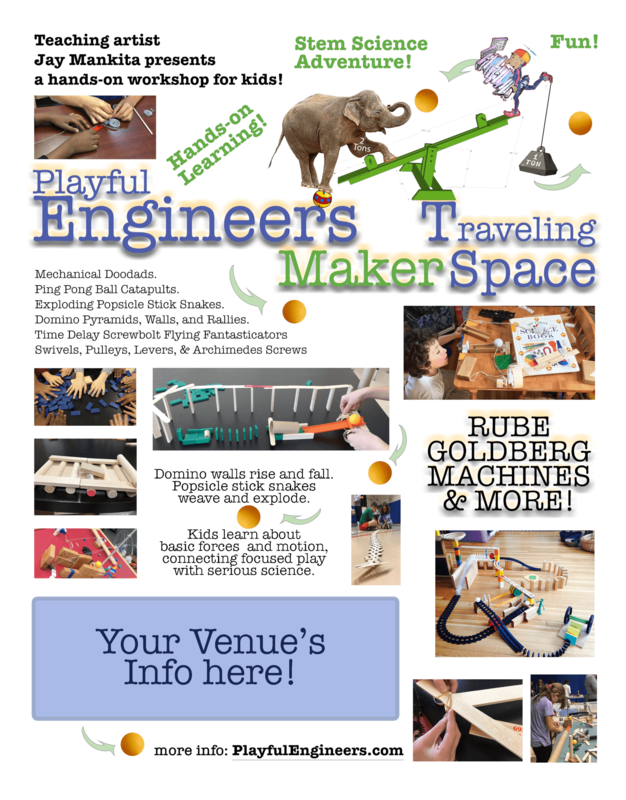 In these hands-on, STEM focused workshops, participants design, build, test, and play with Rube Goldberg "machines”, plus domino constructions, exploding popsicle-stick snakes, and other awesome engineering explorations. Sessions are tailored for all ages, abilities, and locations, and are equally great for focused workshops within a grade, or for the organized chaos of a family science night! "Dear Jay, Thank you so, so much for an amazing day yesterday here at Reading Public Library! Both the children and teen programs were incredible!!! The kids LOVED it and parents raved. Your dedication to education, free-thinking, exploration and tinkering truly shined in both programs as is evidenced by the kids' very creative contraptions. I appreciate you catering the program to the two audiences, especially allowing teens to use tools & hardware, get loud, messy and just have a blast while exploring physics and engineering concepts. Thank you again." "Hi Jay, We wanted to thank you for your visit last week!! The kids really enjoyed it and were very engaged and excited about the program." "Hi Jay, my third grade students and I are so thankful for the incredible STEM experience you gave to us! I have so many awesome videos from their time building - they love watching them to see where they made mistakes, how they fixed them, modified and improved. Thank you!" "I just wanted to thank you for all that you did with our students at Mapleshade School. The kids had such a terrific experience working with you, and the culminating event was also a huge success. It was so nice to meet you, and just keep up the great work, Jay!" sped up video from workshop with older kids. "I was so energized by your presentation! The kids were engaged and enjoyed the experience very much!" "Hi Jay - Thank you for the wonderful workshop you did here at the Attleboro Public Library yesterday! The kids had a fabulous time & learned a lot about force & motion. You were very patient with all of the questions and gave helpful advice when the kids asked. It was great to watch the kids work together & come up with different ideas on how to get their machines to work. Parents & caregivers were quick to tell me how much fun their kids had."